The street balladry of the people who began migrating to America in the early 1600s is considered to be the roots of traditional American music. As the early Jamestown settlers began to spread out into the Carolinas, Tennessee, Kentucky and the Virginias, they composed new songs about day-to-day life experiences in the new land. Since most of these people lived in rural areas, the songs reflected life on the farm or in the hills and this type of music was called "mountain music" or "country music." The invention of the phonograph and the onset of the radio in the early 1900s brought this old-time music out of the rural Southern mountains to people all over the United States. Good singing became a more important part of country music. Singing stars like Jimmie Rodgers, family bands like the Carter family from Virginia and duet teams like the Monroe Brothers from Kentucky contributed greatly to the advancement of traditional country music. "Bill Monroe and the Blue Grass Boys" first appeared on the Grand Ole Opry in 1939 and soon became one of the most popular touring bands out of Nashville's WSM studios. Bill's new band was different from other traditional country music bands of the time because of its hard driving and powerful sound, utilizing traditional acoustic instruments and featuring highly distinctive vocal harmonies. This music incorporated songs and rhythms from string band, gospel (black and white), work songs and "shouts" of black laborers, country and blues music repertoires. Vocal selections included duet, trio and quartet harmony singing in addition to Bill's powerful "high lonesome" solo lead singing. After experimenting with various instrumental combinations, Bill settled on mandolin, banjo, fiddle, guitar and bass as the format for his band. While many fans of bluegrass music date the genre back to 1939, when Monroe formed his first Blue Grass Boys band, most believe that the classic bluegrass sound jelled in 1946, shortly after Earl Scruggs, a 21 year old banjo player from North Carolina, joined the band. Scruggs played an innovative 3-Finger picking style on the banjo that energized enthusiastic audiences, and has since come to be called simply, "Scruggs style" banjo. 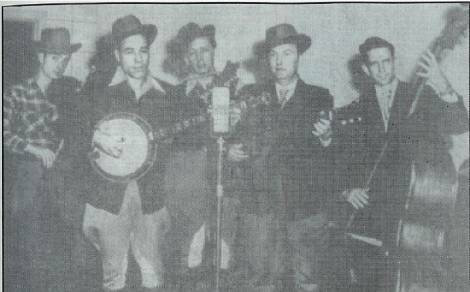 Equally influential in the classic 1946 line-up of the Blue Grass Boys were Lester Flatt, from Sparta, Tenn. on guitar and lead vocals against Monroe's tenor; Chubby Wise, from Florida, on fiddle; and Howard Watts, also known by his comedian name, "Cedric Rainwater," on acoustic bass. When first Earl Scruggs, and then Lester Flatt left Monroe's band and eventually formed their own group, The Foggy Mountain Boys, they decided to include the resophonic guitar, or Dobro into their band format. The Dobro is often included in bluegrass band formats today as a result. Burkett H. "Uncle Josh" Graves, from Tellico Plains, Tenn., heard Scruggs' 3-Finger style of picking in 1949 and adapted it to the then, almost obscure slide bar instrument. 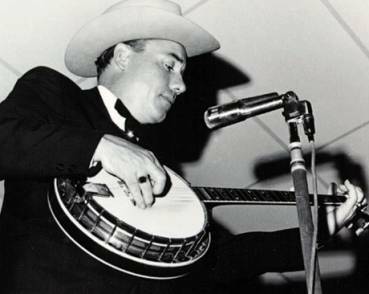 With Flatt & Scruggs from 1955-1969, Graves introduced his widely emulated, driving, bluesy style on the Dobro. From 1948-1969, Flatt & Scruggs were a major force in introducing bluegrass music to America through national television, at major universities and coliseums, and at schoolhouse appearances in numerous towns. Scruggs wrote and recorded one of bluegrass music's most famous instrumentals, "Foggy Mountain Breakdown," which was used in the soundtrack for the film, Bonnie & Clyde. In 1969 he established an innovative solo career with his three sons as "The Earl Scruggs Revue." Scruggs still records and performs selected dates in groups that usually include his son, Randy on guitar, and his son, Gary on bass. After parting with Scruggs in 1969, Lester Flatt continued successfully with his own group, "The Nashville Grass," performing steadily until shortly before his death in 1979. By the 1950s, people began referring to this style of music as "bluegrass music." Bluegrass bands began forming all over the country and Bill Monroe became the acknowledged "Father of Bluegrass Music." In the 1960s, the concept of the "bluegrass festival" was first introduced, featuring bands that had seemed to be in competition with each other for a relatively limited audience on the same bill at weekend festivals across the country. Carlton Haney, from Reidsville, N.C., is credited with envisioning and producing the first weekend-long bluegrass music festival, held at Fincastle, Va. in 1965. The increased availability of traditional music recordings, nationwide indoor and outdoor bluegrass festivals and movie, television and commercial soundtracks featuring bluegrass music have aided in bringing this music out of modern day obscurity. "Lester Flatt and Earl Scruggs & the Foggy Mountain Boys" achieved national prominence with tour sponsorship by Martha White Flour and for playing the soundtrack for previously mentioned film, Bonnie and Clyde, as well as on a television show called The Beverly Hillbillies. The Deliverance movie soundtrack also featured bluegrass music-in particular, "Dueling Banjos," performed by Eric Weissberg on banjo and Steve Mandel on guitar. In 2001, the multi-million selling soundtrack for the Coen Brothers movie, O Brother, Where Art Thou? attracted wider audiences for bluegrass and traditional country music. Bill Monroe passed away on September 9, 1996, four days before his 85th birthday. In May 1997, Bill Monroe was inducted into the Rock and Roll Hall of Fame because of the profound influence of his music on the popular music of this country. Bluegrass music is now performed and enjoyed around the world--the IBMA alone claims members in all 50 states and 30 countries. In addition to the to the classic style born in 1946 that is still performed widely, bluegrass bands today reflect influences from a variety of sources including traditional and fusion jazz, contemporary country music, Celtic music, rock & roll ("newgrass" or progressive bluegrass), old-time music and Southern gospel music--in addition to lyrics translated to various languages.